You are currently browsing articles tagged Bagan market. 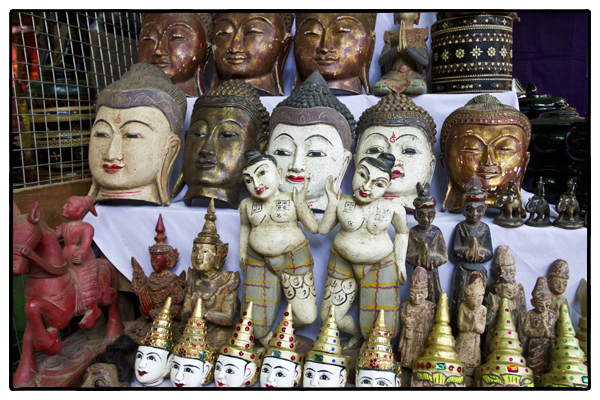 There’s lots of fascinating things to look at and buy at the Bagan market–until the beggars find you. Photos by David Lansing. 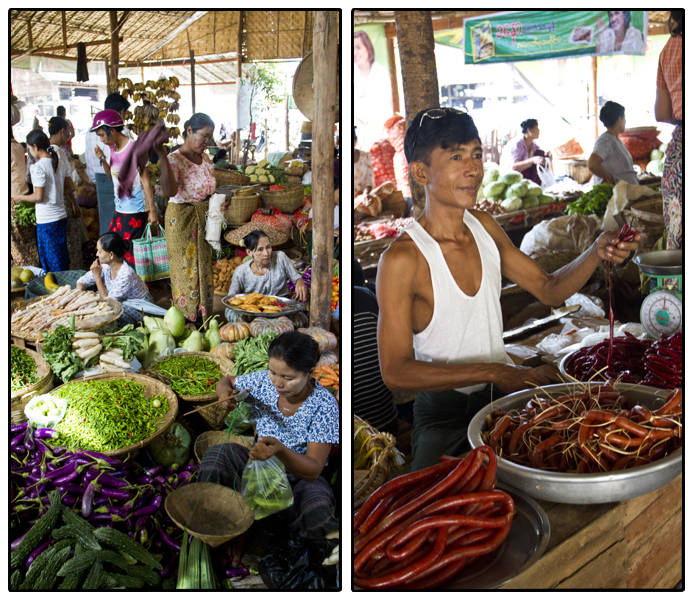 Alex made a mistake at the market in Bagan yesterday. When one of the young children that immediately started following us around handed him a small jar of thanaka, the yellow paste everyone here puts on their face, he took it. I don’t think he even knew what it was. He looked at it curiously, smiled at the kid, and then tried to hand it back. The kid wouldn’t take it. As far as he was concerned, he’d made a sale.”Ta htaun kyat! Ta htaun kyat!” shouted the boy. Alex asked our guide, Sai, what the boy was saying. “He want one dollar,” said Sai. “Give him a buck,” I said, “just so he’ll leave us alone.” By now there were five or six other children, all under ten, clamoring around us, all pushing things at us: gum, bananas, bags of what looked like dried fish. Alex tried to give the thanaka back to the boy. ”Ta htaun kyat!” he yelled. Alex started to reach for his money. “If you give the boy a dollar, fifty children will follow you around the market,” said Sai. In fact, the crowd of youngsters had now grown to more than a dozen. The boy refused. So Alex put the jar on the edge of a vendor’s table. “There it is,” he said. “I’m not taking it.” And then he walked off. The boy grabbed his jar of thanaka. But that was not the end of it. Now the pack of children followed us wherever we went, all of them pushing things at us and asking for kyat. It got so you could not even stop at a stall to look at a Buddha or the baskets of odd spices because if you did, a dozen, two dozen kids would harass you. So we told Sai we wanted to leave and quickly we hustled out of the market. The thing is, we all wanted to buy something—sandals, a longyi (the ubiquitous sarong-like cloth worn by both men and women), beaded bracelets—something. But because we started to feel like we’d been surrounded by a pack of feral dogs, in the end we bought nothing. And left in a hurry. A situation not good for anyone but particularly not good for the vendors at the market. 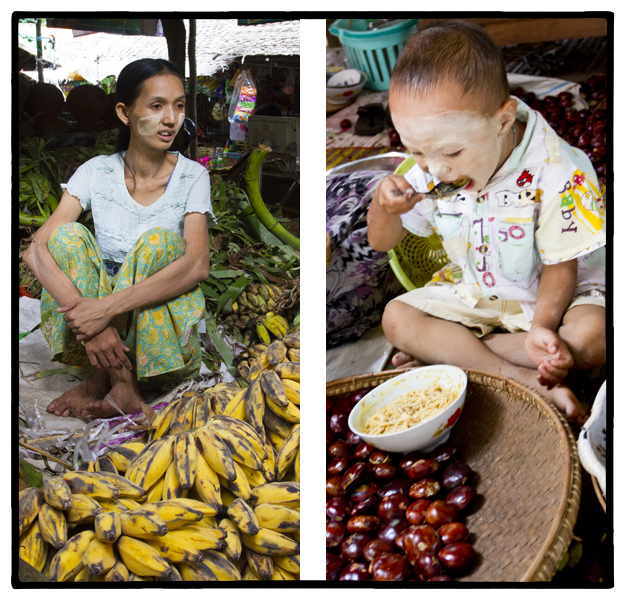 A young woman selling bananas at the market in Bagan, left, and a young boy eating his breakfast both wear thanaka paste on their faces. Photos by David Lansing. You see it everywhere you go in Burma. On the cheeks of a young woman selling bananas; spread widely across the face of a toddler eating noodles for breakfast. Thanaka, a yellowish-white cream made by grinding the bark of particular trees which grow only in places with lots of rainfall—30 inches or more a year—in dry, rocky soil. Here in Burma thanaka is a sunscreen, cold cream, fragrance, and topical cure all in one. Smelling a bit like sandalwood, it is smeared on cheeks and noses to keep from getting sunburned, and rubbed on chins and foreheads to prevent acne and control oiliness. 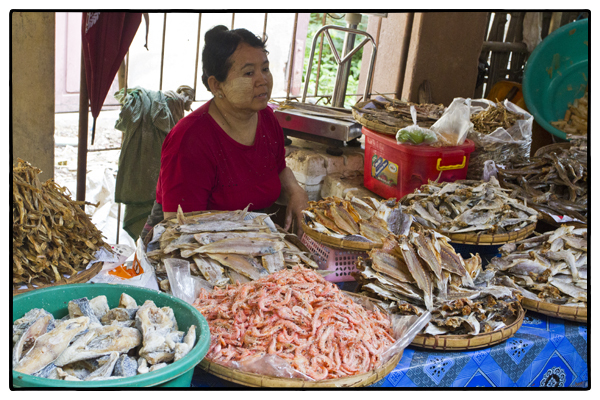 Yesterday at the market in Bagan I saw a dozen women or more selling branches of thanaka. According to my guide, Sai, most of the branches come from trees at least 35-years-old. “It take 5 to 10 years just for trunk of thanaka tree to grow 2 inches in diameter,” he said. Which makes you wonder, since the Burmese have been using thanaka cream for over 2,000 years, how there are even any trees left. 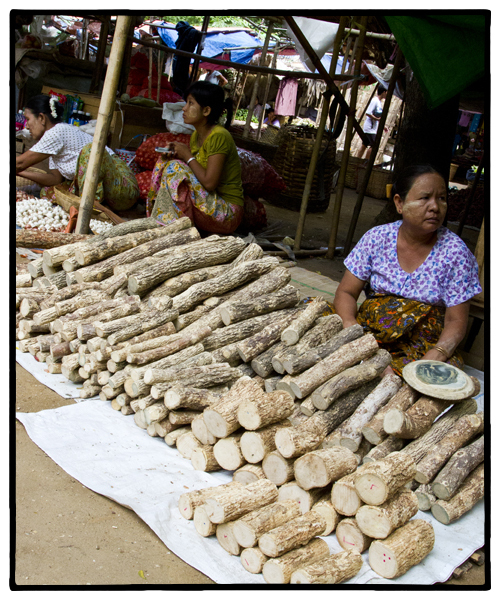 A woman at the Bagan market sells branches of thanaka. The bark is then ground up and mixed with water to form a yellow paste. Photo by David Lansing.